Why are peacock tail feathers so enchanting? “The sight of a feather in a peacock’s tail, whenever I gaze at it, makes me sick,” Charles Darwin told a fellow scientist in a letter in 1860. 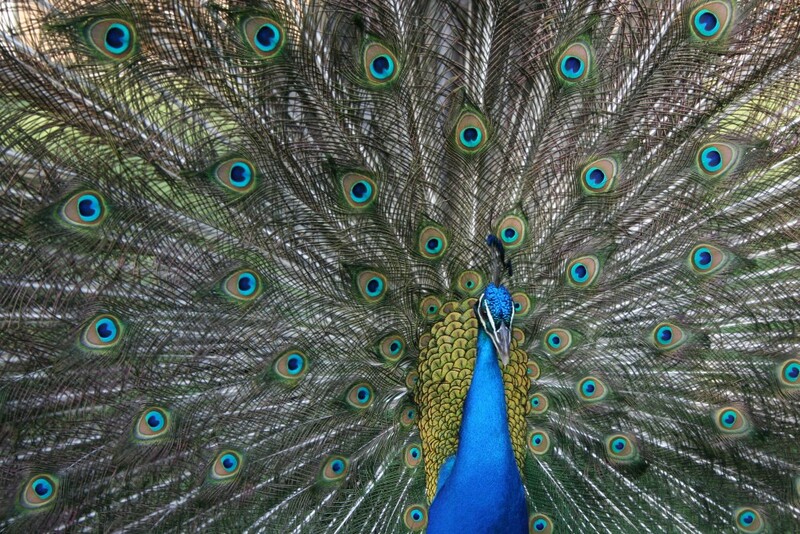 The showiness of the peacock tail initially struck him as a handicap — why would an animal put so much energy into producing a purely ornamental feature? — but it would come to embody an important part of his theory of sexual selection. Today, 150 years later, peacock tails haven’t been terribly well researched. To understand the role they play in sexual selection, scientists studied feather length and they studied the number of eyespots, and neither proved to play a major role in wooing. Now, a group of interdisciplinary scientists have turned their attention to another factor: the almost hypnotizing shaking of the long tail feathers known as “train-rattling.” The findings were published April 27 in the journal PLOS ONE. Train feathers are the the long, quintessential green, blue and bronze plumes that made the male peacock famous. In train-rattling, the bird shakes the train feathers to create a shimmering, iridescent background while the eyespots appear motionless. Researchers filmed male and female peacocks at a botanical garden near Los Angeles with high-speed cameras. When train-rattling, the birds used the shorter, grey tail feathers to strum the longer feathers like a guitar. On average, they did it at a rate of 25 times a second. Like a parent pushing a child on a swing, the male’s tail feathers vibrate the plumes in an energetically efficient manner. The strumming even produces a percussive, rustling sound. But why the eyespots stand relatively motionless while the feathers move required more explanation. Back in the lab, the team mechanically shook individual train feathers to measure their vibration. Shorter feathers shook at a higher resonant frequency than longer feathers. The effect is analogous to a musical tone made on a violin as compared to a cello. A pluck of a violin’s shorter string produces a higher pitch at a higher resonant frequency than the same motion on the longer strings of a cello. The difference in frequencies was smaller than fellow author and physicist Suzanne Amador Kane expected, and the eyespots remained practically stationary only at the resonant frequencies observed in train-rattling. Kane said two factors were at play. First, the loose barbs along the feathers’ length cause friction that altered the vibration action. Images taken by a scanning electron microscope also revealed tiny hook-like feathers on the eyespots. These hooks anchor the end of the train feather, creating a perception of stillness. Iridescence too, seems to play a role. In a 2013 study, Biologist Roslyn Dakin found that iridescence — the change of an eyespot’s hue in relation to light angle — explained about half of mating success. Place stickers over the male’s eyespots, and mating rates drop to near zero. But how train-rattling factors into sexual selection remains to be seen. Because the team did not factor mating success into this study, future research could investigate how iridescence and shaking work together to catch a female’s eye. Scientists could also explore why larger birds shook their feathers faster than predicted in the lab, and whether that is significant in mate selection. Either way, Kane is pleased the research can help advance an age-old mystery.